Arizona House Democrats: Quit stalling. Fund our schools now. Quit stalling. Fund our schools now. Last week on the Senate Lawn, more than a dozen organizations joined their voices together to demand immediate support for Arizona’s public schools. Parents, community leaders and teachers implored the governor and legislators to honor the will of the voters and pay the debt owed to public schools. These advocates urged the governor to call a special session and use the $325 million projected surplus to help cover the K-12 inflation funding judgment. This judgment is the result of a five-year-old lawsuit filed because Republicans in the Legislature refused to fully fund a voter-approved inflation formula for K-12 schools. Negotiations to settle the lawsuit reached an impasse last month. Because the settlement talks failed, the Legislature is obligated to pay schools the more than $300 million owed to them immediately. But Republican leaders are appealing the order and attempting to delay the payment… again. Republicans have the means to fund schools now, but they are choosing not to. The state’s projected surplus is now $325 million – up from the initial $250 million projection. Instead of taking immediate action, the governor has proposed a land trust deal that might get money to schools in several years. And Republican leadership in the Legislature released a vague funding plan that would sweep money from the First things First program. It seems obvious that Arizonans want more for our schools. A new poll shows that most Arizonans think the state does not spend enough on schools and that it is affecting the quality of education students receive. If the Republicans in Arizona are serious about funding Arizona schools, they’ll quit stalling and use the surplus to get money into classrooms now. Instead, they are playing political games with the future of Arizona kids – as schools face crisis and the state loses business and employment opportunities. 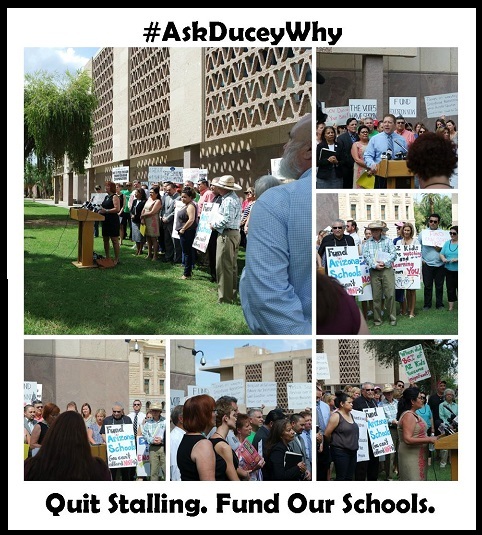 #AskDuceyWhy he and other Republican leaders won’t make funding schools and protecting Arizona’s future a priority.